In a far-off country, beyond the sea and the mountains, there lived a king and queen, with a beautiful daughter, who was called Princess Ladna. Now among the princess’s rejected suitors there was one, who though he had changed himself into the shape of a prince, in order to come to court and make love to her, really was an ugly dwarf, only seven inches high, but with a beard more than seven feet long, and a great hump on his back. He was so offended with the princess for refusing him, that he determined to carry her off; so he watched his opportunity. The garden was very extensive, and full of beautiful fruit-trees; so she lived upon these fruits, and drank the water of a spring in the garden for some time. She used to make fun of the dwarf’s impotent rage. Sometimes when he rushed wildly about the garden, she would tease him by taking off the invisible cap, so that he saw her before him, in all her beauty; but when he made a rush after her she would put it on again, and become invisible to him; she would then throw cherry-stones at him, come close to him, and laugh loudly: and then run away again. He went on for three days, never stopping for food or rest; but on the fourth day, at dusk, he felt overcome by sleep; so he let his horse go free in a meadow, and himself lay down on the grass. Then all at once he heard a piercing shriek, and straight before him beheld a hare, and an owl perched upon it—its claws digging into the poor creature’s side. 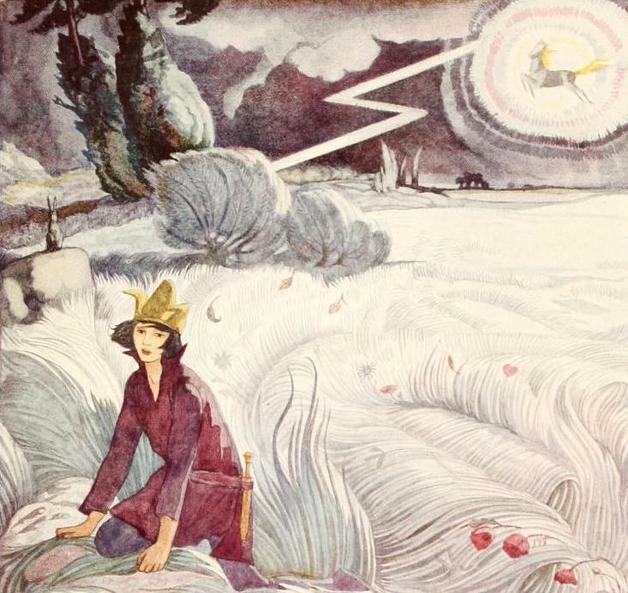 “The horse appears in the storm.” Illustration by Cecile Walton, published in Polish Fairy Tales by Maude Ashurt Biggs (1920), John Lane Company. So the prince crept in at the horse’s left ear, and came out again at the right one, all clad in golden armour. He also found himself miraculously increased in strength, so that when he stamped on the ground it trembled; and when he shouted a storm arose, which shook the leaves from the trees. “Then I confess, prince,” replied the head; “that I am in your power; but be merciful to me, for I am worthy of pity. I am a knight of the race of giants, and were it not for the envy of my brother, I should still have been happy. He was the black sheep of our family, and was born an ugly dwarf, with a long beard; and my handsome giant-like proportions caused him to hate me bitterly. His only good point is his great strength, and it all resides in his long beard, and so long as it is not cut he cannot be conquered, and this can only be done by that sword, which you now hold. “So he laid his ear to the ground, and I mine. I listened; but heard nothing; and he meantime, having got hold of the sword, crept up to me, and cut my head from my shoulders. “Drop down to the ground, off which you took me,” said the prince. The invisible servants of the dwarf, seeing their master’s beard, wreathed about the prince’s helmet, threw open all the doors to him at once. Overcome with joy, he called her by her name; but she had been cast into such a deep sleep by the dwarf’s poisonous breath, that he could not rouse her. But that very night, one of Princess Ladna’s rejected suitors, riding that way, saw by the light of the moon those two asleep, and he recognized in them the princess, and the prince, his fortunate rival. So first stabbing the latter through with his sabre, he carried off the princess, and bore her on horseback before him to her father. The king welcomed him rapturously, as his daughter’s deliverer. But when he found, to his dismay, that he could not awake her, with all his caresses, he asked the supposed rescuer what this meant. The Golden-Mane vanished, and the prince, calling his own horse, and taking with him his invisible cap, betook himself to the court of his loved one’s father. When the traitor knight heard this he took to his heels; Prince Dobrotek touched the sleeping princess’s forehead with the beard, she woke up directly, gazed at him fondly with her lovely eyes, but could not at first understand where she was, or what had happened to her.